I have so many thoughts swirling through my mind that I am not sure that I can make any sense this morning…but I will try. In fact, I think mostly I will just pose the questions I asked myself this morning. In a classroom setting, I never asked many questions but when I am with the Lord sometimes that is all I have. So often over the beginning months of this year, Exodus 33 has continued to jump into my life. It has been referenced in devotionals I have randomly picked up to read. I have listened to sermon podcasts as I walk and it may not be the sermon text but Exodus 33 will be referenced. It has been key in a Bible study I am working through with others. There comes a time where it is not random but purposeful. Now Moses used to take the tent and pitch it outside the camp, far off from the camp, and he called it the tent of meeting. And everyone who sought the LORD would go out to the tent of meeting, which was outside the camp. Whenever Moses went out to the tent, all the people would rise up, and each would stand at his tent door, and watch Moses until he had gone into the tent. When Moses entered the tent, the pillar of cloud would descend and stand at the entrance of the tent, and the LORD would speak with Moses. And when all the people saw the pillar of cloud standing at the entrance of the tent, all the people would rise up and worship, each at his tent door. Thus the LORD used to speak to Moses face to face, as a man speaks to his friend. When Moses turned again into the camp, his assistant Joshua the son of Nun, a young man, would not depart from the tent. I don’t suppose that I will write anything that hasn’t already been said or written about this passage. I will say that I don’t particularly like camping but if that was the only way that I could meet with the Lord, I would be hunting for my stakes. I spent sometime this morning wondering who I am in this passage. Am I like Moses that pitched the tent and has the distinction of having the LORD speak to him face to face as a man speaks to his friend? Am I one that seeks the LORD…goes to the tent but doesn’t enter in? Am I one that watches Moses (other people) cultivate a rich friendship with God? Am I like Joshua that does not leave the tent? Today we do not have to pitch a tent to meet with God. Our tent is our heart perhaps even our minds. We can experience the Presence of God anywhere at anytime. How wonderful is that? At Thanksgiving, we traveled and visited my parents and my grandfather also came to spend the time with us. That first evening together, my dad grabbed me by the arm and told me to come into their den. My mom, Carl and my grandfather were all present. My dad closed the pocket doors on both sides of the den and we all stood in the center of the room while my grandfather gave me an amazing gift…precious and sentimental. The air was full with emotion and all I could do was cry and repeatedly say to my beloved grandfather “thank you” and “I love you”. It was so unexpected and so heartfelt. Each face revealed love and joy. I had received the gift but each one was better for the offering. Well, true confession time…I just wrote my grandfather a proper thank you note last week…please don’t count the months. This is really unlike me. I tend to be much more prompt in writing thank you notes. However, every time I went to write him, I wept. Other times I didn’t know what to say…how to express the love and sacrifice of his gift. Some days I would just say to myself that I would write it the next day…I procrastinated. There were days that I was just plain busy or sick or something else…excuses. Finally covered with embarrassment, I sat down and I wrote from my heart and expressed my overflowing gratitude and mailed the letter. A couple days later, I received a call from my sweet 90-year-old grandfather. Did he scold me for being so tardy in conveying my gratitude? Not at all. He thanked me for writing him such a nice letter. He knew already that I was deeply touched by his gift and he was so happy to give it to me. He went on and on about how much he loved me and my family. How thankful He is to us. As usual, he gave me more than I could ever give him. Sometimes I think we can approach God like I did in putting off writing my note. Oh gosh, doesn’t anyone get how busy I am? Through the saving blood of Christ we have been given a spiritual tent where God dwells with us. He is always waiting for us….wanting to speak to us like a friend. Sometimes all we can mutter is “thank you” and “I love You”…but He will fill in the gaps and as is His nature…we will go away having received so much more than we dared to offer Him. So today I am asking myself and I am asking you…what is the state of your tent? 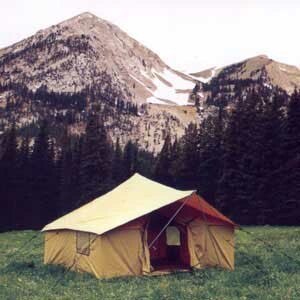 Is your tent in disrepair? There is a Healer. Is it missing a couple of stakes? There is a Provider. What needs to be removed to get to your tent? There is a Deliverer…a Redeemer…a Savior. What I realized afresh today was that just like in that little den with my loved ones that spending time being loved by someone has a ripple effect. When we spend time tending to our tents, others are the benefactors as well. Let yourself be loved by Him…pitch that tent today. Oh Helen, I loved this. Going to mark it “unread” even though I did read it–so I can come back and read it again.